Cromwell, aided by Thomas Harrison, forcibly dismissed the Rump on 20 April 1653, for reasons that are unclear. Theories are that he feared the Rump was trying to perpetuate itself as the government, or that the Rump was preparing for an election which could return an anti-Commonwealth majority. Many former members of the Rump continued to regard themselves as England's only legitimate constitutional authority. The Rump had not agreed to its own dissolution; their legal, constitutional view it was unlawful was based on Charles' concessionary Act prohibiting the dissolution of Parliament without its own consent (on 11 May 1641, leading to the entire Commonwealth being the latter years of the Long Parliament in their majority view). The dissolution of the Rump was followed by a short period in which Cromwell and the Army ruled alone. Nobody had the constitutional authority to call an election, but Cromwell did not want to impose a military dictatorship. Instead, he ruled through a 'nominated assembly' which he believed would be easy for the Army to control since Army officers did the nominating. Barebone's Parliament was opposed by former Rumpers and ridiculed by many gentries as being an assembly of 'inferior' people. However, over 110 of its 140 members were lesser gentry or of higher social status. (An exception was Praise-God Barebone, a Baptist merchant after whom the Assembly got its derogatory nickname.) Many were well educated. Commonwealth government under the Barebones was officially by a Council of State and Parliament. In 1653, Oliver Cromwell became Lord Protector under England's first written constitution the Instrument of Government, and then under the second and last written full constitutions, known as the Humble Petition and Advice of 1657. This meant executive power solely vested in the Lord Protector under a written and rewritten constitution that mandated that he summon triennial parliaments that should sit for several months each year. On the death of Oliver Cromwell in 1658, his son, Richard Cromwell, inherited the title, Lord Protector. Internal divisions among the Republican faction and quiet lobbying by moderates led to his resignation, the end of the Protectorate and a second brief spell of Commonwealth government by a Council of State and Parliament. After seven months the Grandees in the New Model Army removed him and, on 6 May 1659, they reinstalled the Rump Parliament. Charles Fleetwood was appointed a member of the Committee of Safety and of the Council of State, and one of the seven commissioners for the army. On 9 June he was nominated lord-general (commander-in-chief) of the army. However, his power was undermined in parliament, which chose to disregard the army's authority in a similar fashion to the pre–Civil War parliament. On 12 October 1659 the Commons cashiered General John Lambert and other officers, and installed Fleetwood as chief of a military council under the authority of the Speaker. The next day Lambert ordered that the doors of the House be shut and the members kept out. On 26 October a "Committee of Safety" was appointed, of which Fleetwood and Lambert were members. Lambert was appointed major-general of all the forces in England and Scotland, Fleetwood being general. Lambert was now sent, by the Committee of Safety, with a large force to meet George Monck, who was in command of the English forces in Scotland, and either negotiate with him or force him to come to terms. It was into this atmosphere that General George Monck marched south with his army from Scotland. Lambert's army began to desert him, and he returned to London almost alone. On 21 February 1660, Monck reinstated the Presbyterian members of the Long Parliament 'secluded' by Pride, so that they could prepare legislation for a new parliament. Fleetwood was deprived of his command and ordered to appear before parliament to answer for his conduct. On 3 March Lambert was sent to the Tower, from which he escaped a month later. Lambert tried to rekindle the civil war in favour of the Commonwealth by issuing a proclamation calling on all supporters of the "Good Old Cause" to rally on the battlefield of Edgehill. However, he was recaptured by Colonel Richard Ingoldsby, a regicide who hoped to win a pardon by handing Lambert over to the new regime. The Long Parliament dissolved itself on 16 March. On 4 April 1660, in response to a secret message sent by Monck, Charles II issued the Declaration of Breda, which made known the conditions of his acceptance of the crown of England. Monck organised the Convention Parliament, which met for the first time on 25 April. On 8 May it proclaimed that King Charles II had been the lawful monarch since the execution of Charles I in January 1649. Charles returned from exile on 23 May. He entered London on 29 May, his birthday. To celebrate "his Majesty's Return to his Parliament" 29 May was made a public holiday, popularly known as Oak Apple Day. He was crowned at Westminster Abbey on 23 April 1661. A flag used by the Commonwealth Parliamentary Navy and privateers beginning on 22 February 1649. A flag of the Commonwealth flown by the Admiral, Vice-Admiral, and Rear-Admiral. 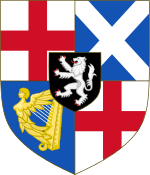 On 5 March 1649 the Council ordered "that the Flagg that is to be borne by the Admiral, Vice-Admiral, and Rere-Admiral be that now presented, viz., the Armes of England [Red St. George Cross on white] and Ireland [gold harp on blue] in two severall Escotcheons in a Red Flagg, within a compartment." Flag of the Commonwealth from 1651 to 1658. Standard of the Lord Protector from 1655 to 1659. A flag used by the Commonwealth after 1658. ^ a b Schultz 2010. ^ "November 1650: An Act for turning the Books of the Law, and all Proces and Proceedings in Courts of Justice, into English". ^ Culture 24. "Parliament Week: A Cromwellian Act and Seal from the Cromwell Museum". Culture24.org.uk. Retrieved 10 January 2015. ^ Sevaldsen 2007, p. 39. ^ "House of Commons Journal Volume 8: 8 May 1660". ^ a b "Tuesday 23 April 1661". The Diary of Samuel Pepys. ^ "House of Commons Journal Volume 8: 30 May 1660". ^ The parliamentary navy was ordered by the Council of State on 22 February 1649 as follows: "that the ships at sea in service of the State shall onely beare the red Crosse in a white flag"